On this 7 day Tanzania Camping Safari you will experience it all! From the amazing wildlife to the impressive landscapes and meeting the local people. 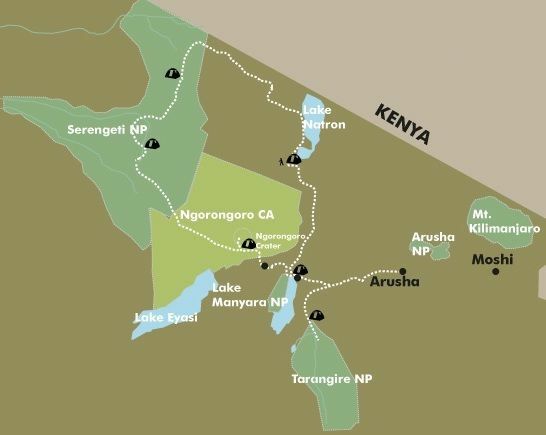 We will explore the highlights of Northern Tanzania and enjoy safaris in the Tarangire National Park, Lake Natron, the Serengeti National Park and the Ngorongoro Crater. Unique to this safari is the “off the beaten track” trip to Lake Natron, offering you a real sense of adventure. Click on the map to enlarge. You will be picked up in the morning and after a short briefing you will head off in direction of the Tarangire National Park to start your Tanzania Camping Safari. The park with its savannah, baobab trees, seasonal swamps is home to huge elephant herds. Animals gather at the Tarangire River and you should see a selection of mammals ranging from giraffes, bushbucks and hartebeests to zebras and warthogs. The park is also home to buffaloes, zebras and wildebeests which are always closely followed by a range of predators such as lions. Leopards can sometimes be seen, but cheetahs are rarely spotted. From the open roof of the safari vehicle you will be able to absorb the landscape and watch the animals. In the late afternoon you will leave the park and head to a nearby campsite, where you will spend the night in a safari tent. We depart from the Tarangire area after breakfast and head to the village of Mto wa Mbu. From here you will travel on a spectacular and very bumpy gravel road along the Rift Valley Escarpment. The destination for today is the typical Masai village of Ngare Sero in the hot and dusty Rift Valley. In the distance you might see a pink glow of the flamingos breeding and feeding on the algae in the alkaline Lake Natron (seasonal and depending on water level). In the afternoon you will join a Masai guide on a walk to a nearby waterfall before you return to the campsite for your overnight. After an early start you will travel along adventurous dirt tracks with spectacular views as your vehicle climbs out of the Rift Valley to reach the grassy plains of the Serengeti by midday. Serengeti means “endless plains” in the language of the Masai and you will see the grassland savannah stretching to the horizon. The Serengeti is the most famous park in Tanzania and it is home to the largest animal migration on the planet – hundreds of thousands of animals trek to find fresh grass and water. You will overnight at a campsite in the northern or central part of the park. The entire day is dedicated to game viewing (safari) in the Serengeti National Park. You will either go on a full day game drive or join early morning and afternoon drives in the Seronera area, depending on last night’s stop. Between December and May, huge herds of wildebeests and zebras will be seen, with calves and foals being born between January and March. The Seronera area is also the best place to spot the leopard. You will spend the night at a campsite in the Seronera area. The morning is set aside for another game drive (safari) in the Serengeti. Animals tend to be more active in the morning before the temperatures soar around midday. After lunch, you will leave the plains of the Serengeti and travel to the highlands of the Ngorongoro Conservation Area. You will camp at a campsite directly on the Ngorongoro Crater’s edge with a view over the collapsed volcano. It is a perfect spot to enjoy a sundowner at sunset. It will be an early wake-up to take on the steep path leading down into the 600 m deep crater. The slopes are forested but soon the landscape changes to savannah with the occasional acacia tree here and there. The wildlife in the crater is just breath-taking and with a little luck you might see the “Big Five” – lion, elephant, buffalo, rhino and leopard. You could also see warthogs, wildebeests, zebras, hippos and some of the more than 500 bird species of the area. After an entire morning of game viewing and a picnic lunch in the crater, you will travel to Mto wa Mbu where you will overnight on a campsite.